Dr. Khajavi received his undergraduate degree from Emory University in 1985, and his medical degree from Georgetown University School of Medicine in 1989, through a scholarship from the US Air Force. He completed his neurosurgical residency at the Cleveland Clinic Foundation in 1996. Dr. Khajavi returned to active duty and served in the Department of Neurosurgery at Walter Reed Army Medical Center. Dr. Khajavi was the first Air Force officer to ever be given an appointment in the department of Neurosurgery at Walter Reed. While there he served as the Chief of Epilepsy and Functional Surgery sections. He held an appointment as Assistant Professor of Surgery at the Uniformed Services University of Health Sciences, and also held a secondary appointment in the department of Neurology. 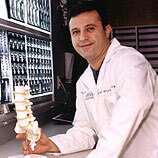 Shortly after his return to Atlanta in 2002, he founded Georgia Spine & Neurosurgery Center, which is located on the campus of Piedmont hospital in Buckhead. Neurosurgical Consultant for the Atlanta Falcons for many years, and served the same role for the Atlanta Thrashers hockey club until they moved to Canada in 2011. He is the team neurosurgeon for the Atlanta Silverbacks professional soccer club. Additionally, he is the Director of Neurosurgery for the Sports Concussion Institute, a nationally recognized leader in sports concussion management. Dr. Khajavi has published numerous scholarly articles and book chapters in the fields of spinal and brain disorders and has garnered national recognition for his contributions to the field. He remains actively involved in teaching and holds clinical faculty appointments at both Mercer and Georgia State Universities. Dr. Khajavi founded the Institute for Spinal and Neurosurgery Research (INSPIRE), a non-profit, independent scientific organization dedicated to research and education in the fields of neurosurgery, spine surgery, and head/spine injury.